A-England’s Ballerina is a collection of four beautiful, delicate holographic polishes in whisper-soft colours. The collection immediately reminded me of the tulle on dancers’ skirts… how perfect! Dancing with Nureyev is blue-purple holographic with a metallic finish that almost changes colour depending on the light. It is a little more indigo in some light, then a little more purple, but always demure. A-England is available directly from their website for those in the UK, or from several stockists this side of the pond (check out Where to buy), including Nail Polish Canada (with free shipping within Canada!). Don’t forget to follow A-England on Facebook, Instagram and Twitter, and Nail Polish Canada on Facebook and Twitter! Have you tried any of the Ballerina shades, and which one is your favourite so far? Is that not a perfect, slightly dusty purple? In order to retain some of the beauty of Elaine, I decided to apply a gradient of Shimmer Polish Gerry, a sparkly mix of violet and blue glitter with some red, black and silver glitters dispersed throughout. If you know Shimmer Polish (and if you don’t, what are you waiting for! See some of my posts here), you know that Shimmer creates some sparkly ultra-fine glittery gems. Get your very own Shimmer Polish here. Be sure to like Shimmer on Facebook to participate in their contests and see more gorgeous photos and new creations! I usually purchase A England from Nail Polish Canada or from their US stockist Llarowe (but please check out A England’s site to see their other stockists as well). So what did you think of my regal purple mani? Happy Thursday!! I am so thrilled this is a shortened week and I get to have a long weekend… just what I need. I hope some of you get to enjoy a day off as well…or at least a beautiful weekend! Today I have for you one of my favourite boutique brands, piCture pOlish, made in Australia! I have worn quite a few piCture pOlishes, some that I should probably still share on this blog, but I do have another first for you: my first piCture pOlish glitter polish. And a polish with such a cute name: Ariel’s Tale! I keep hearing “Under the Sea” in my head when I see the bottle. 🙂 Ariel’s Tale is a gorgeous turquoise glitter top coat in a clear base, composed of monochromatic tiny square and medium hex glitters. Simple and gorgeous! I received so many compliments on this manicure!! The aqua of Ariel’s Tale is soft enough for an elegant, work-appropriate manicure, even on such a stark background. And it sparkled like diamonds on my tips! For a completely different look, I paired Ariel’s Tale with Nubar’s Into the Wild, a beautiful muted emerald green (with its own post coming soon!). I already have some more ideas for Ariel’s Tale, maybe wearing it over a light base… but which of today’s looks is your favourite? To get your very own Ariel’s Tale, visit piCture pOlish on-line and or visit any piCture pOlish Network member, including Harlow & Co, Llarowe and Nail Polish Canada. So it would seem that I’m on a bit of a piCture pOlish kick… Yesterday it was piCture pOlish Cosmos (which, by the way, is spectacular!!) and today I bring you my very first Ozotic, another Aussie brand that piCture pOlish has added to their portfolio of phenomenal polishes. Lancelot is one of the most spectacular polishes, and one of the few I wear again and again (and again!). A England really got it right with their debut collection…. just look at that shine!!! And the wear on these is incredible. I can go up to 10 days with a little bit of tipwear. Amazing! A purple duochrome? Yes please! Click on the picture above to see its full-size splendour… a dreamy, sugary, pinky-purple confection that leans gold or yellow, depending on the light. And the best part? You can add the Ozotic Sugars over even day-old polish, if you like, to give it new life. And this polish dries in moments! To get your hands on any of the Ozotics, visit piCture pOlish on-line or any of their Network members, including Harlow & Co and Llarowe. And don’t forget to follow the Girls on Facebook, Twitter and Pinterest for all the latest news! First up, a-England’s Elaine. Stunning, regal, elegant. A perfect purple creme, with an incredible high shine – like the rest of this collection. I adore a-England. Elaine became the base for this stunning glitter, from Aphrodite Lacquers’ Friday Night Glitter Bombs Collection (previously reviewed here, here ,here, and here), Velvet Rope. One of the most gorgeous OPIs (in my humble opinion) from the Muppets collection was Wocka Wocka, a rich, deep, cool-hued red with a multi-chromatic shimmer. I wish I wore this colour more often because I adore it. Finally, one of my summery go-to colours from OPI, Miami Beet, a beautiful deep berry creme, became the base for Aphrodite’s Pre-Party, a sheer pink polish base with color changing shimmer that goes from pink to coppery gold, and multiple different pink, black, and white glitters. Here is one of it in the shade… I love the shimmer reflecting off this. Most of these OPI colours are still available at fine salons, and Aphrodite Lacquers can be found on Aphrodite’s Etsy shop. And don’t forget to follow Aphrodite Lacquers on Facebook and Twitter for the latest news! In keeping with the rather grey and dreary weather fueled by Hurricane Sandy today, I thought I would bring you gorgeous greys: one of my favourite Shimmer Polishes with my very favourite a-England Gothic Beauty! a-England, a bijoux brand that I simply adore, recently released a dark collection named Gothic Beauties. I adore vamps and had to have all five polishes the moment Adina released them!! And today I bring you my first review of this collection, featuring the gorgeous Dorian Gray. All of the Gothic Beauties have the beautiful black a-England Camelot as a base, and Dorian Gray is as dark of a gunmetal grey as you can get, even shining in a pearly black in some lights. This beautiful metallic gunmetal is described as “an intensely sinister pewter grey, forged with a forgiving deep golden shimmer.” And how sinister it is! The deep golden shimmer is very subtle, allowing Dorian to reflect in more of a metallic sheen. Like many of my a-Englands, Dorian Gray was a one-coater — thick and self-levelling, and really not needing a second coat (though I did apply one). The best part? It’s a smooth, liquid thicker polish, drying quickly and evenly, showing nary a brush stroke. Do you see that golden, blueish shimmer? As if Dorian Gray wasn’t spectacular enough on its own, I added this incredible Shimmer Polish that I adored the moment it arrived: Shimmer Vanessa, a slightly darkened jelly base featuring pewter, silver and red glitters, with some black thrown in for good measure. You would think such a dark polish may be subdued, but not Vanessa. It was sparkling in the dimmest light!!! It was simply spectacular! It was insanely sparkly!!! People stopped me to compliment this manicure! Tell me that is not a swoon-worthy polish! I love how elegant this mani turned out. It was sparkly and party-ready, but not in-your-face. 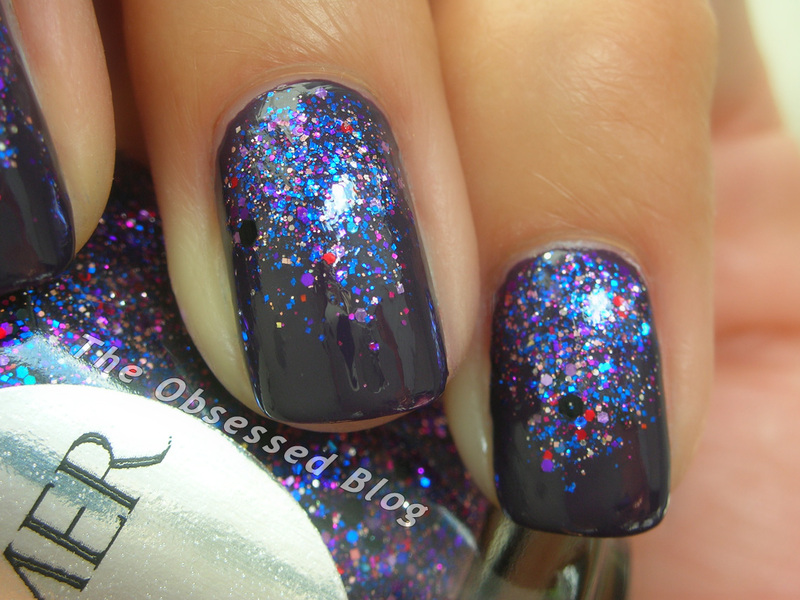 I wore this mani to a concert at a classic concert hall, with a gorgeous black dress… it was perfection! You can purchase a-England’s Gothic Beauties (along with all their other beauties) directly on their website, from Nail Polish Canada, or from their US stockist Llarowe. And you can find Shimmer Polish here. Be sure to like them on Facebook to participate in their contests and see the latest offers! Go Pink Wednesday, Week 2! Wow, we are already in week 2 of our joint Go Pink effort to in support of Breast Cancer Awareness month. Andrea from Finger Painting Fingers (who led this amazing effort!) and a whole slew of bloggers are sharing our pink manis every Wednesday throughout October! Today I bring you some of my favourite pink manicures. First up, one of my very favourite “near-nudes” that I have previously written about here, A England’s Iseult. This stunning, delicate pink polish is perfect for everything from a wedding mani to an office-appropriate mani. Next I have another stunner, this time from piCture pOlish. I featured this polish as part of piCture pOlish’s Blogfest! Here is Tease! Is this silver microglitter not amazing? So what is your favourite pink polish of all time?